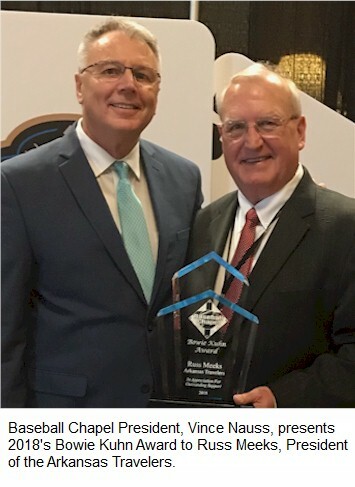 The Bowie Kuhn Award is presented annually at the Baseball Winter Meetings (since 1984) to an individual, team or organization who demonstrates support of the chapel program in professional baseball. The award is named after the fifth man to hold the office of Commissioner of Baseball (1969-1984) and honors the man who gave approval in 1973 to Baseball Chapel to provide ministry to all Major League Baseball teams. “While I normally tried to reach conclusions in a thoughtful way, occasionally I followed hunches. I did so in 1973 when Waddy Spoelstra of the Detroit News, a recovering alcoholic, called and asked if I would fund a program of Baseball Chapel services for each major league club, a born-again Christian talking to a Catholic commissioner. Related site: see details viagra buy the pill have a peek at this thread.